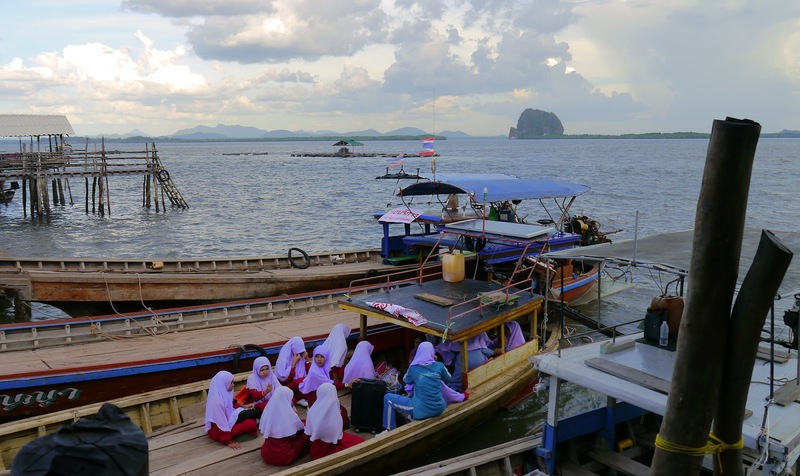 School girls taking the long tail ferry home. We were welcomed to Koh Jum with a gorgeous sunset. Going over the dive plan with our instructor. 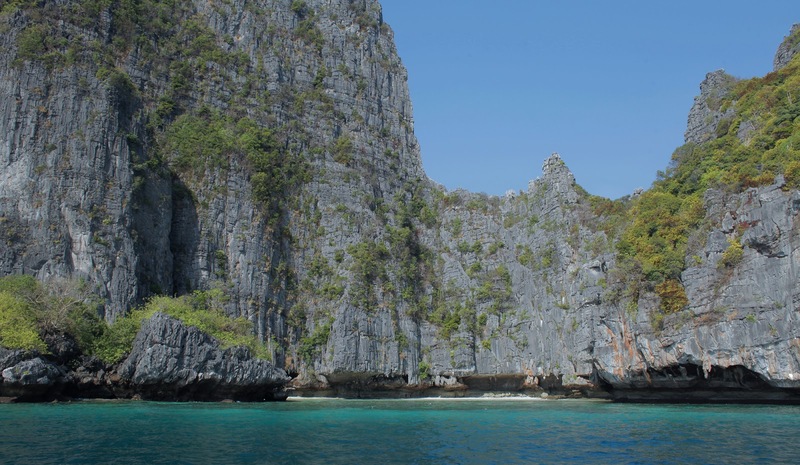 Our third dive site on Ko Phi Phi Ley. 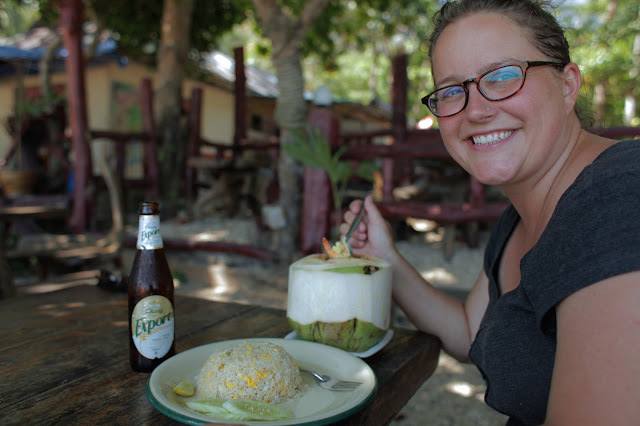 Shrimp curry in a young coconut with pineapple fried rice. Someone's doing the tropical thing right. We got a special visit from our good friend, the awesome Daniel Bellury. We met up in Bangkok, drank a bunch and then headed for Koh Jum. The three of us flew down to Krabi and took a long tail boat over to the island. 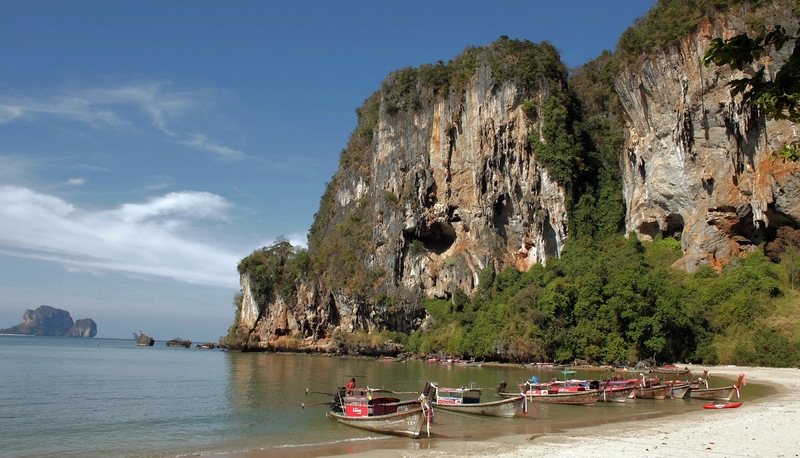 Koh Jum was written up as one of the lesser-developed islands on the Andaman Sea side of Southern Thailand. And it was just that. The western side was dotted with bungalow resorts. We opted to stay at the cheap at Bo Daeng. It was, um, basic. But the food was good, the beer was cold and cheap and we were right on the beach, so we couldn't really complain. Though we did complain a little amongst ourselves about the clientele - a group of hippie-types that you couldn't cast any better. There were the Spanish circus kids who howled all the time; the know-it-all, very opinionated Calgarain; the Thai-Canadian loner who took a job working at the bungalows; and an 'original' hippie from Oregon. But it was all good, we had a job to do: get our PADI Open Water Certification. Our first day was spent relaxing and swimming. But then we hit the books, or rather the water. Daniel and I spent all day in the pool at Koh Jum Divers doing our 'confined water' sessions. Then the following day we took a boat over to Bida Nok and Bida Noi for our first two open water dives. It was insane. 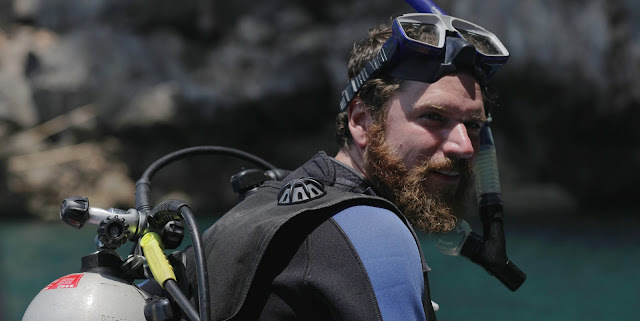 We went over the skills required and then went diving. We saw all kinds of brightly-colored tropical fish, a moray eel, a Hawksbill turtle, a sea snake, pufferfish and boxfish. All of these while swimming along in an amazing coral reef. 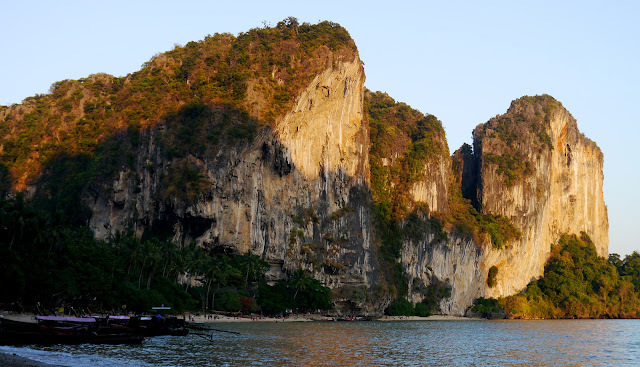 The following day Bree joined us as we headed to Koh Phi Phi Ley (made famous in the the movie The Beach). The diving again was incredible. Saw more of the above mentioned fish, plus a Green Turtle, a few squid, and almost sharks. Our instructor saw two but we just missed them. I don't want to talk about that. Our dive instructor, Vera, an Irish girl, was great. While she was laid-back and patient with us, she also made sure that we were retaining all the knowledge. She claimed that we were great students, which may be true, but I know I still have a lot to learn. Believe me, I am very eager to continue. Diving is one of the most surreal, dream-like things I have ever done, and I am so happy I finally took the time to get my certification. After we finished the PADI course, we headed up to Railey, and specifically to Tonsai Beach. More breathtaking landscape. We had to take a trek through the jungle to reach Tonsai but it was well worth it. The beach features massive limestone karst formations jetting up from the crystal-clear turquoise sea. We only had a day there, but again it was totally worth it. Back in Bangkok for a night. Daniel unfortunately had to leave. And unfortunately lost his new iPhone. We played some more cards and drank some more beers before he had to get a few hours sleep and head to the airport. It was great to have him join our expedition for a week. And now we're divers!